William Galston of the Brookings Institute and Walter Russell Mead of the Hudson Institute will join Herzl Institute President Yoram Hazony for a launch event for Hazony’s new book The Virtue of Nationalism. The event will be at the Hudson Institute in Washington, DC on Tuesday, September 4, 2018. You can register to attend the event here. Ofir Haivry, John Selden and the Western Political Tradition (Cambridge) explores the Jewish foundations of the Anglo-American constitutional tradition as understood by John Selden, the greatest of 17th-century England’s conservative political thinkers. This is the first book to examine Selden’s political theory, showing how he used the Jewish people and the rabbinic tradition as the model for England and its common law. Joshua Berman, Inconsistency in the Torah: The Limits of Source Criticism(Oxford) mounts to the most systematic critique of academic theories of biblical authorship in a generation in this breathtaking work. If you thought source criticism had won the scientific debate, it is time to rethink. 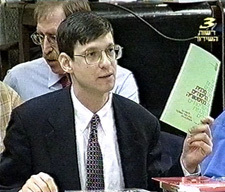 Jeremiah Unterman, Justice for All: How the Bible Revolutionized Ethics (Jewish Publication Society). A sweeping reconstruction of how the Hebrew Bible broke with the ethical theories of the ancient Near East to establish the basis for morality as we know it. Taken together, these three works offer a thorough reconsideration of the place of Judaism in the history of Western civilization. Congratulations to all on a truly remarkable achievement, many years in the making! Herzl Conference Explores: What Was ‘The Revelation at Sinai’? The concept of torah from heaven plays a central role in Jewish theology. But what precisely does it mean to say that the Jewish torah or teaching is from heaven? From June 18-22, 2017, ninety scholars and advanced students gathered at the Herzl Institute’s conference to discuss “The Revelation at Sinai: What Does ‘Torah From Heaven’ Mean?” Speakers included: R. Shalom Carmy (Yeshiva University), James Diamond (University of Waterloo), Lenn E. Goodman (Vanderbilt University), R. Gil Student (Independent Scholar), Shira Weiss (The Frisch School), William J. Abraham (Southern Methodist University), and Jonathan Burnside (University of Bristol). For two weeks around the conference, Jewish and Christian students and young PhD’s came from as far as Brazil, Korea, and China to attend the Herzl Institute’s Young Scholars Workshop, and hear lectures from senior scholars at the conference. A book based on papers from the conference is in preparation. The conference and workshop are part of the Jewish Philosophical Theology project at the Herzl Institute, which is sponsored by the John Templeton Foundation. More details on the conference are available here: Revelation at Sinai conference website. Eis in Jewish Action: Are We Praying to the Wrong God? Herzl Institute Educational Director R. Rafi Eis has published a moving essay on the problem of teaching young Jews about God in the Fall 2017 issue of Jewish Action. In “Praying to the Wrong God? An Old-New Approach to Tefillah Education,” Eis argues that medieval concepts may be holding religious youth back from approach God. This essay is a response to the Herzl Institute’s workshop on “Teaching Tanach as a Source of Theology and Philosophy,” which took place on August 1-4, 2016, and which Eis organized as convener. The workshop was conducted with the support of the John Templeton Foundation. Read R. Eis’ essay in Jewish Action here. Yoram Hazony will lead a session at the “Inaugural Conference on Jews and Conservatism” sponsored by the Jewish Leadership Conference in New York on December 3, 2017. Other speakers include Elliott Abrams, Charles Krauthammer, Yuval Levin, Dennis Prager, and Amb. Ron Dermer. See program details and registration here. Former Education Minister Gidon Saar and Herzl Institute Vice President Ofir Haivry outline a proposal for a reset of stagnant US Middle East policy in the Jerusalem Post. Read the article here. Is the Biblical God Perfect Being? What Does it Mean for God to Speak? Should God Be Our King? Who Makes Things Happen in the Bible? Participants will also take part in the sixth international conference in the “Philosophical Investigation of the Hebrew Scriptures, Talmud and Midrash.” The conference topic for this year is “The Revelation at Sinai: What Does ‘Torah from Heaven’ Mean?” Click here for more information about the Conference. Workshop dates: June 12-22, 2017. The Jewish Philosophical Theology Project at the Herzl Institute, with the support of the John Templeton Foundation, will hold its sixth annual conference in Philosophy of the Bible, Talmud and Midrash in Jerusalem on June 18-22, 2017. The conference will address the topic The Revelation at Sinai: What Does ‘Torah from Heaven’ Mean? For more information, see the conference announcement.